Because films can establish, reinforce, and/or change a society’s myths and ideologies, they provide a unique view of a particular society. Focusing on School Ties (1992) and The Bells of St. Mary’s (1945), I will examine how Judaism in School Ties and Catholicism in The Bells of St Mary’s become more Americanized. While the films were made decades apart and depict different times and different religions, the depictions of the Americanization of non-Protestant religions practiced by immigrants are notably similar. By embracing American culture, by downplaying traditions, and by becoming more personal, Judaism and Catholicism, immigrant religions in School Ties and The Bells of St. Mary’s respectively, transform into acceptable American religions. Directed by Robert Mendel, the 1992 drama School Ties focuses on a working-class teenager who earns a football scholarship to an elite and prestigious prep school in Cabot Massachusetts. A hard working American teenager from Pennsylvania succeeding in football and academics to the point of earning a scholarship is a stereotypical American dream success story. 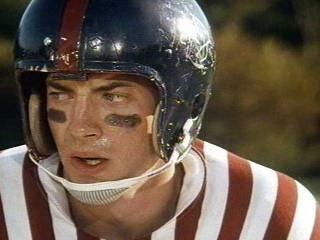 But School Ties is different in one important way – the protagonist, David Greene (played by Brendan Fraser) is Jewish. While his religion is the main source of the film’s drama, the fact that Greene is an otherwise textbook American teenaged boy, who sings the popular songs, plays football, and studies with his peers, shows part of Judaism transforming from an immigrant religion to an American religion. For a religion to become Americanized, its followers must become Americanized; by embracing and succeeding at sports and academics – valued aspects of American culture – Greene (and because of him, Judaism) becomes more American. 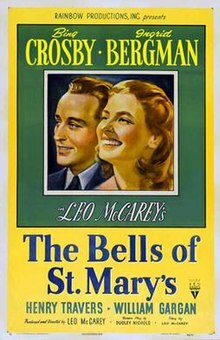 In Leo McCarey’s 1945 drama The Bells of St. Mary’s, the sequel to Going My Way (1944), Catholicism is front and center. 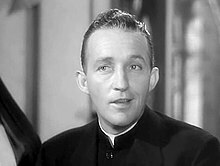 Starring Bing Crosby and Ingrid Bergman, the film became one of the top three grossing films at the time of its release; that kind of box office success alone for a film about Catholics demonstrates greater Americanization of Catholicism in and of itself. To a greater extent, the Catholics in The Bells of St. Mary’s are shown in their lives beyond strictly religious activities. Ingrid Bergman’s character, a nun named Sister Benedict, is in many ways a traditional Catholic – but she’s not just a Catholic. She plays baseball, arguably the most American of all sports, and she teaches a student how to box and even takes a punch from the student, showing the toughness that America has always been known to admire. By showing that Catholics are in so many ways similar to the rest of Americans, as seen in their love of baseball, the Catholic religion becomes more of an American religion. Not only does Greene participate in popular American activities in School Ties, he also notably downplays his Judaism, although, of course, not completely. For example, Greene easily fits in with his Christian classmates at first, because his Judaism doesn’t blatantly affect much of his daily life. Greene quietly removed and put the gold Star of David that he wore around his neck into a box of Band-Aids, trying to hide his religious beliefs. While anti-Semitism is undoubtedly present in his peers, the fact that Greene’s Judaism was kept a secret at all shows that he could fit in and dress like the other guys without having to stick to strict, traditional Jewish clothing. Even when the Jewish holiday Rosh Hashanah occurs on a Saturday, Greene plays in a football game before reading his prayers that evening, which would not have been allowed by more traditional, observant Jews. By breaking his Jewish tradition, which wouldn’t allow him to play football, he helped his team win the game, which is a valued accomplishment in American culture. By downplaying his religion, he was able to fit in with society to a greater extent. Building upon their love of sports, the Catholics in The Bells of St. Mary’s, while dressed in religious clothing, are rarely, if at all, shown in traditional Catholic settings, such as Mass. Focusing on their personal relationships and struggles, the main characters were people who happened to be Catholics to a much greater extent that they were ‘just Catholics.’ This downplayed Catholicism allowed Father Chuck and Sister Benedict to be viewed as Americans, rather than being defined by their religious beliefs. By emphasizing their personal lives, their religious lives were made more American as well. Arguably nothing is more American than the idea of individualism. While embracing American culture and downplaying religion can help transform immigrant religions into American religions, nothing could help as much as a strong individual personality. Sociologist Max Weber defined authority into office charisma, which is rooted in institutional authority, and personal charisma, which is solely based on an individual. As individualism is so deeply rooted in our nation’s civil religion, our society places a great deal of respect and emphasis on personal charisma. By utilizing personal charisma, individuals can transform their immigrant religions into American religions. Greene in School Ties is an attractive, muscular, intelligent, and fearless white male. With his personal charisma, and despite being hurt by the system rather than empowered by it, Greene was able to be the hero of the film. America loves an underdog; at the end of the film, Greene, who had been targeted throughout the whole film, sees the movie’s antagonist who tells him that he’s still going to Harvard and Greene will still be a Jew – but Greene triumphantly replies “And you’ll still be a prick,” before walking away. Characterized not as a Jew, Greene is depicted as an athletic, attractive and intelligent teenager who overcomes adversity. Judaism is Americanized by being associated an individual, Greene, rather than more abstract traditions and ideas. Father Chuck plays the same role as a strong individual representing a religion in The Bells of St. Mary’s. As an attractive, intelligent, and charming white male, Father Chuck plays the role of both an ideal father and an ideal mother – he’s an all-around good person. He does gain respect through his friendliness and likeability, gaining him personal charisma, but without a doubt is his authority respected, especially with his office charisma rooted in his institutional authority as a priest. However, unlike the stereotype of a strict and very serious priest, Father Chuck wants everyone to have fun and be happy. It’s not the ideas and beliefs of Catholicism that make it American, it’s the personality of people like Father Chuck that truly Americanize the religion. Judaism and Catholicism have historically faced significant discrimination through history in the United States. However, the religions, once limited to small minorities of immigrants, are now widely accepted as ‘American.’ While the film industry has often enforced (and will likely continue to enforce) societal persecution of various groups, it has also, and will continue to, help assimilate and empower various groups as well. In School Ties and The Bells of St. Mary’s, Judaism and Catholicism transform into American religions by embracing American culture, downplaying their religious traditions, and becoming more personal. This entry was posted in Culture, Religious Studies and tagged america, american religion, bells of st marys, catholic, catholicism, christianity, culture, film, hollywood, jewish, jews, judaism, matt damon, movie, movies, priest, Religion, religious studies, roman catholic, school ties by Mac McCann. Bookmark the permalink.